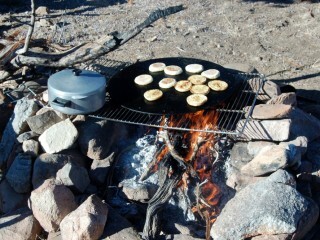 If you are an outdoor enthusiast who enjoys camping and good food, then Mojoe Griddle is a must have item. This griddle works great over a campfire – but will also work nicely on a Weber kettle BBQ or other gas BBQ if you want to cook something up on your back deck. It features over three square feet of restaurant quality cooking surface. Because it is made of high quality thick hot rolled steel the material far exceeds the cast iron pot metal that is used on more portable griddles on the market. The Mojoe Griddle has a huge cooking surface (over three feet!) which makes it one of the largest cooking surfaces on the market today. 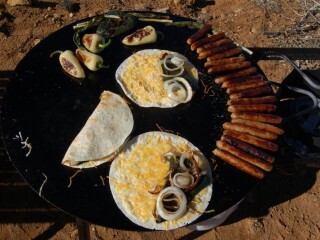 The griddle has no edge lip or grease trough so clean-up is super quick and easy (just scrape everything off and in to the campfire when you are done!) Another big bonus is that it comes with a lifetime warranty. Not a big camper?? How about sports? 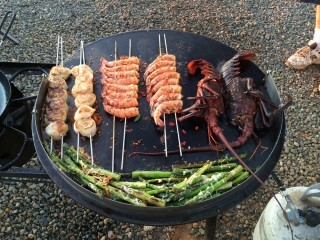 This grill would be ideal for your next tailgate party!